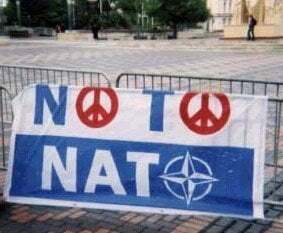 Seventeen year ago: March 1999, NATO’s war on Yugoslavia. Article originally published in 1999 on Jackson Progressive, published by Global Research in 2003. General Wesley Clark (image right) , NATO’s Supreme commander in Europe, confirmed in late May  that “NATO’S air campaign has not reached its peak yet and the alliance should be prepared for more civilian casualties.”. 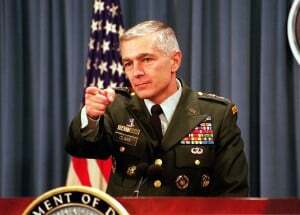 General Clark also confirmed that “he would be seeking to increase the number of air strikes in Kosovo and expand the range of targets. 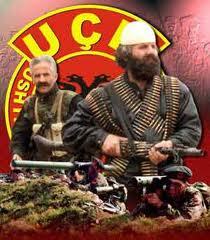 Ethnic Albanians have not been spared by NATO air raids. Killing ethnic Albanians in Kosovo is said to be “inevitable” in carrying out a “humanitarian operation on behalf of ethnic Albanians”. In addition to the impacts of the ground war between the KLA and the Yugoslav Armed Forces, the bombings and the resulting radioactive fall-out in have been more devastating than in the rest of Yugoslavia. With the “diplomatic shuttle” still ongoing, the Alliance is intent on inflicting as much damage on the Yugoslav economy (including Kosovo) as possible prior to reaching a G8 brokered “peace initiative” which will empower them to send in ground troops. “Allied commanders have steadily widened their list of economic targets… Increasingly, the impact of NATO air strikes has put people out of work… causing water shortages in Belgrade, Novi Sad and other Serbian cities. … [T]he effect was to shut down businesses, strain hospitals’ ability to function and cut off water…”4. In this regard, NATO’s military intervention in Yugoslavia (in violation of international law) also sets a dangerous precedent. It provides “legitimacy” to future military interventions. To achieve its strategic objectives, national economies are destabilised, regional conflicts are financed through the provision of covert support to armed insurgencies… In other words, the conflict in Yugoslavia creates conditions which provide legitimacy to future interventions of the Alliance into the “internal affairs of sovereign nations”. In the meantime, a career US diplomat, Ambassador William G. Walker [see image on the right] was appointed Head of the OSCE Kosovo Verification Mission (KVM). A tailor-made assignment: Walker was well-known for his role in the “Iran-Contragate” scandal during the Reagan administration. The KLA insurgency was in many regards a “carbon copy” of the Nicaraguan Contras which had also been funded by drug money with covert support from the CIA. The proposed “Marshall Plan” financed by the World Bank and the European Development Bank (EBRD) as well as private creditors will largely benefit Western mining, petroleum and construction companies while fuelling the region’s external debt well into the third millennium. And the countries of the Balkans are slated to reimburse this debt through the laundering of dirty money in the domestic banking system which will be deregulated under the supervision of Western financial institutions. Narco-dollars from the multi-billion dollar Balkans drug trade will be recycled (through the banking system) and channeled towards servicing the external debt as well as “financing” the costs of “reconstruction”. Statement by UNICEF Representative in Belgrade, quoted in Yugoslav Daily Survey, Belgrade, 23 May 1999, No. 4351. Report by Dr Siegwart-Horst Guenther, meeting of the PBS (Federal Socialists), Bonn, 17 May 1999.
International Action Center, “NATO Bombing Unleashes Environmental Catastrophe in Europe”, Press Release, 14 May 1999). Joseph Fitchett, “Is Serb Economy the True Target? Raids Seem Aimed at Bolstering Resistance to Milosevic”, International Herald Tribune, Paris, 26 May 1999. Tanjug Press Release, 25 May 1999. Statement to Ambassadors of 19 NATO Countries, quoted in Daily Telegraph, London, 28 May 1999. Sean Gervasi, Bosnia and Vietnam, draft text, 1995. Financial Times, London, 6 May 1999, p. 2. The Boston Globe, 8 April 1999. Dr. Mary-Wynne Ashford, “Bombings Reignite Nuclear War Fears”, The Victoria Times-Colonist. 13 May 1999, page A15. Mary-Wynne Ashford is co-president of the Nobel Peace Prize winning IPPNW. Quoted in Mary-Wynne Ashford, op. cit. Quoted by Dr. Mary-Wynne Ashford, op. cit. Dr. Mary-Wynne Ashford, op cit. Quoted in The Washington Post, May 9, 1999, page A20. World Socialist Website editorial, 24 May 1999. Diana Johnstone, On Refugees, Paris, 30 May 1999. 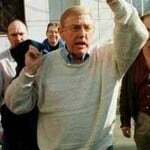 See “Lawyers Charge NATO Leaders Before War Crimes Tribunal”, Toronto, 6 May 1999. See Financial Times, 27 May 1999. See “Lawyers Charge NATO Leaders Before War Crimes Tribunal”, Toronto, 6 May 1999; see also Jude Wanniski, “Memo to US House Majority Leader”, Polyconomics, New York, 10 May 1999. Lawyers Charge NATO, op cit. Chicago Tribune, 10 May 1999. 28. Intelligence Report from the German Foreign Office, January 12, 1999 to the Administrative Court of Trier. Status Report of the German Foreign Office, November 18, 1998 to the Upper Administrative Court at Mnster, February 24, 1999. See, Roland Keith, “Failure of Diplomacy, Returning OSCE Human Rights Monitor Offers A View From the Ground in Kosovo”, The Democrat, May 1999. US Department of Defense Press Release, 6 April 1999. The stated purpose of the mission was “to discuss a range of security issues with the recent ethnic clashes in Kosovo.” In Skopje, the agenda consisted in examining security arrangements to be implemented after the termination of United Nations UNPREDEP programme. Background briefing by a Senior Defense Official at NATO Headquarters, Thursday, June 11, 1998. US Department of Defense, Background Briefing, July 15, 1998. For further details see Michel Chossudovsky, Kosovo `Freedom Fighters’ Financed by Organised Crime, Ottawa, 1999. Quoted in The Daily Telegraph, London, 25 September 1998. See Federation of American Scientists, “Operation Determined Force”, 24 March 1999, see also Financial Times, October 12, 1998. Quoted in Federation of American Scientists, op. cit. See Roland Keith, Appendix, op. cit. United States Court of Appeals, for the District of Columbia Circuit, Filed January 23, 1996, Division No. 86-6, in Re: Oliver L. North. Roland Keith, Appendix, op. cit. Confirmed by several press reports as well as statements of the KLA, see also Radio 21 Dispatch, Tirana, February 28, 1999. Roland Keith, Appendix, op cit. Daily Telegraph, London, 29 January 1999. Federation of American Scientists, op. cit. 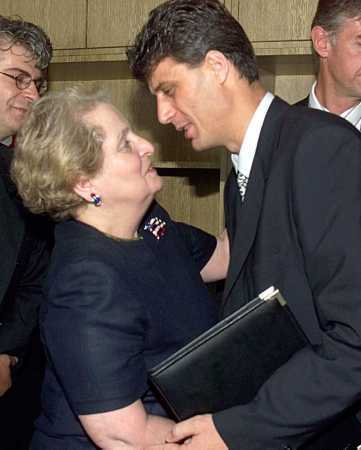 “Margaret Warner talks with Cook about the latest developments in the Yugoslav conflict”, Jim Lehrer News Hour, 21 May 1999. New York Times, 26 May 1999. Washington Post, 23 May 1999. Action launched in United States District Court for the District of Columbia, Complaint for Declaratory Relief, Preliminary Statement, District of Columbia, 27 May 1999. Ibid., see also Truth in Media, Phoenix, 23 May 1999. Washington Post, 27 May 1999. Sunday Telegraph, London, 18 April 1999. Libration, Paris, 19 May 1999. Chris Steven, “Bin Laden Opens European Terror Base in Albania”, Sunday Times, London, 15 November 1998. “War Crimes Panel Finds Croat Troops ‘Cleansed’ the Serbs,” New York Times, 21 March 1999. NATO Press Briefing, 14 May 1999. Jim Lehrer News Hour, op cit. 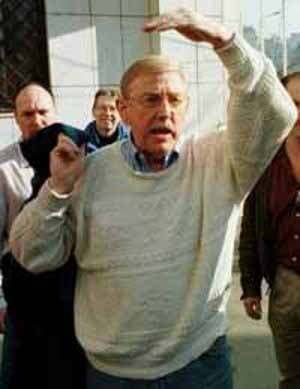 According to Canadian MP David Price, April 19, 1999, UPI Press Dispatch. 64. Sunday Telegraph, London, 18 April 1999. “US Is Trying to Reconcile Ethnic-Albanian Separatists”, Belgrade, Tanjug Press Dispatch, 30 May 1999. Quoted in Tanjug Press Dispatch, 14 May 1999. See Michael Radu, “Don’t Arm the KLA”, CNS Commentary from the Foreign Policy Research Institute, 7 April, 1999). New York Times, 2 February 1999. Tanjug Press Dispatch, 30 May 1999. See World Bank Development News, Washington, 27 April 1999. See Michel Chossudovsky, Dismantling Yugoslavia, Colonising Bosnia, Covert Action Quarterly, No. 56. Spring 1996. Statement by Javier Solano, Secretary General of NATO, published in The National Post, Toronto May 1999). See Jan Oberg, Press Info, no. 59, Insecuring Macedonia, Transnational Foundation TFF, March 18, 1999. Jane Intelligence Review, June 1999. See Michel Chossudovsky, The Globalisation of Poverty, Impacts of IMF and World Banks Reforms, Third World Network Penang and Zed Books, 1997, chapter 8.